I am beginning to think that this truly is the winter that will never end! Oh well, I refuse to let that get me down! Put the yeast and sugar in a measuring cup and add the WARM water. Set aside and give the yeast time to proof, about 10 minutes. While the yeast is proofing, put your flour and salt in the bowl of the stand mixer. After 10 minutes have elapsed, the yeast should be alive and active. There will be a foam on the top of the water. Turn the mixer on low and slowly add the yeast mixture to the flour. The flour and yeast will come together and make the dough. You may have to use a rubber spatula to scrap the sides of the bowl. Turn your mixer up one level and allow the dough to knead for 5-6 minutes. While the dough is kneading, take this time to oil a large mixing bowl. When your dough has finished kneading, place in the oiled bowl and cover with a damp towel. Let it rise, in a warm place, for 1 hour. After the dough has risen it should be double in size. Now you will need to heavily flour your work space and place the dough on it. Cut into 3 equal parts. This will give you 3 thin baguettes. If you would like a little heartier loaf, cut the dough in 2 parts. IT WORKS BEST IF YOU ONLY CUT THE DOUGH INTO TWO EQUAL PARTS. Take a moment and fold the ends under. Each loaf should measure about 12 inches long. Place all 3 loaves on a floured baking sheet. Cover, again, with a damp towel and allow to rise for another hour. While the dough is rising, take this opportunity to place one rack on the very top of your oven, and one rack on the bottom. On the bottom rack you will want to place the cast iron skillet or a baking sheet. Pre-heat the oven to 475. After about an hour the loaves will have doubled in size. They are nearly ready to bake. But, before you put them into the oven, take a pairing knife and score the loaves 3 or 4 times. Put the loaves on the top rack and pour 1 cup of water into the skillet. Quickly close the door and DO NOT OPEN IT!! What you are doing here is creating that steam environment that artisan breads need to get nice and crusty on the outside and soft and chewy on the inside. The loaves will bake for 30 minutes. However, at about 20 minutes I would starting keeping an eye on them. I only baked mine for 25. There you have it! Beautiful baguettes. No special pan, no steam oven. While the inside is soft and chewy! Standing mixer with a hook attachment. In a 2 cup measuring cup, add your yeast and sugar. Then fill the measuring with 1 1/2 c. of WARM water. Stir and set aside for 10 minutes to allow the yeast to activate and proof. While yeast is proofing add the flour and salt to the bowl of your stand mixer with the hook attachment. When yeast is proofed and active, turn your mixer on low and slowly add your yeast mixture. When all the yeast is incorporated, turn the mixer up one level and allow to knead for 6 minutes. You may have to use a rubber spatula to scrap the flour off the sides of the bowl. While the dough is kneading, you will need to oil a large bowl. Cover with a damp towel and allow the dough to rise, for one hour, in a warm place. It should double in size. After dough has doubled in size, dump onto a floured surface, and cut into two equal pieces. Roll each piece into a 12 inch rope and place onto a parchment lined baking sheet or into a baguette pan. 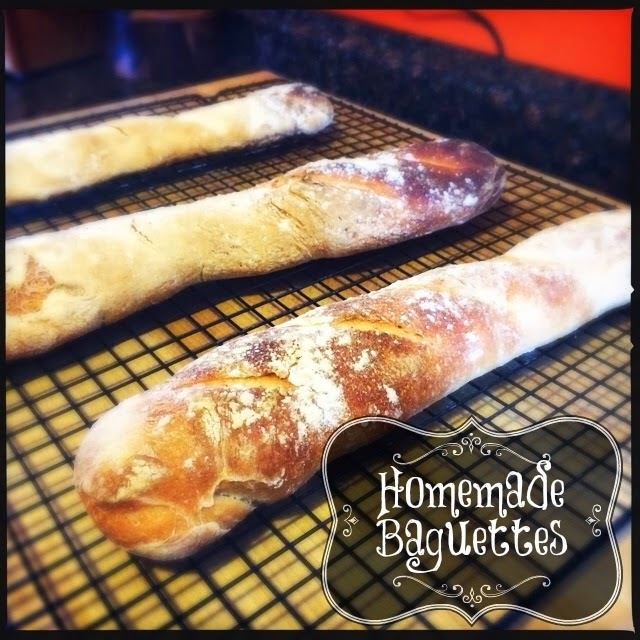 Using a pairing knife, place 3-4 shallow slits in the top of your baguette loaves. Cover with a towel and let rise again for one hour. It should double in size. While dough is rising, place one rack in your oven on the highest setting, and the other rack on the lowest. Place a cast iron skillet or baking sheet on the lowest rack and pre-heat your oven to 475 degrees. When your baguettes have finished rising, place them on the top rack of your oven and pour 1 cup of water into your skillet or baking dish and close the door. Allow them to bake for 30 minutes. Remove from oven and place on cooling racks.